Yes- you read this post title correctly! 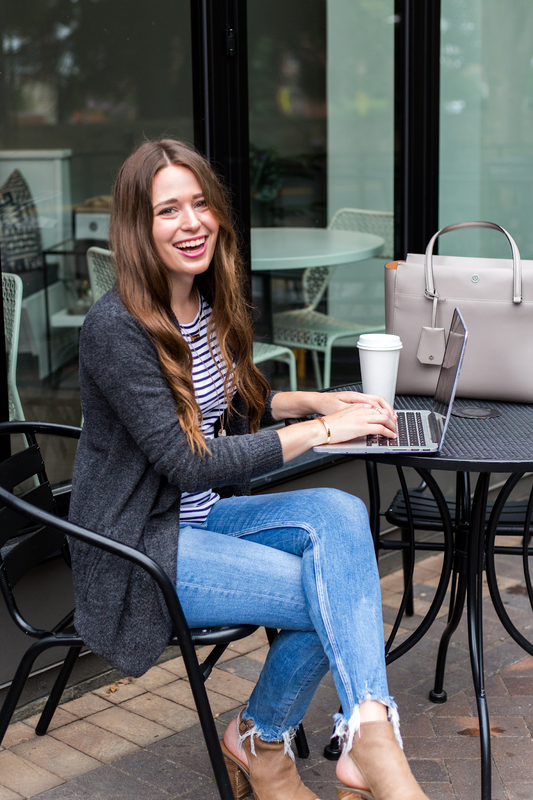 I'm a fashion blogger... and I only purchased three items from this year's Nordstrom Anniversary Sale! That's right- I didn't blow my whole shopping budget for 2018 or go into debt shopping this sale, haha. 😉I'm proud of the self-control I exercised during this year's NSale, and I'm really happy with the three items that I now own. Check out today's look to see how it all styled together! Here you have it friends- my purchases styled! (One of them you can't see pictured- the Natori Feathers Contour Bra. But I am wearing it here and I have been wearing it a lot since I got it- it's very comfortable!) 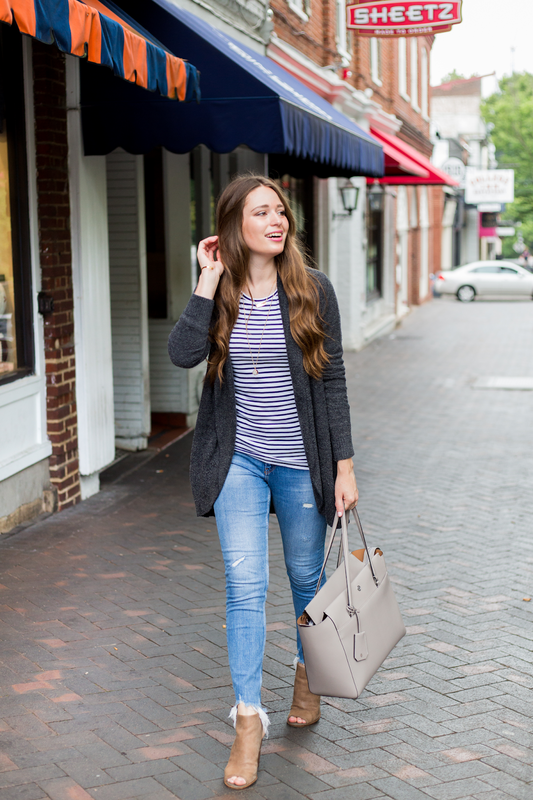 I'm absolutely obsessed with the Barefoot Dreams cardigan and this Caslon striped shirt. Let's talk about the cardigan first. 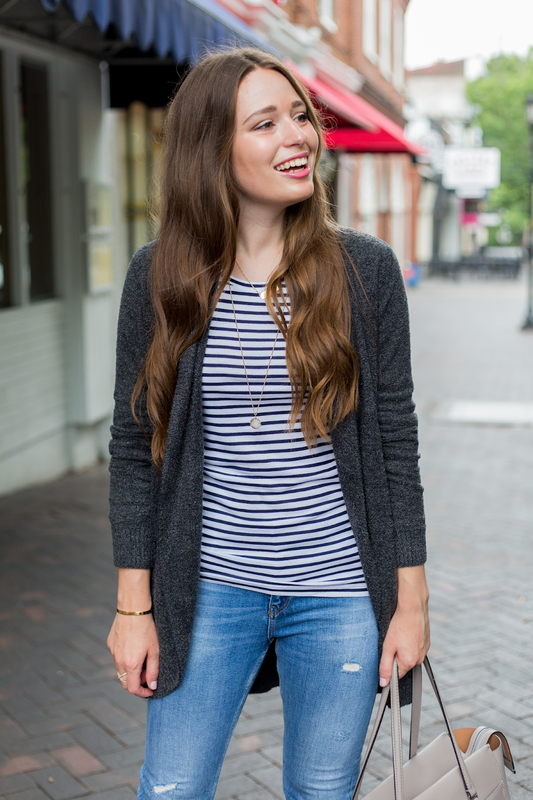 I am so glad I decided to spluge on a Barefoot Dreams cardigan in this year's NSale! One thing that you may or may not know about me is that I'm a bathrobe enthusiast. No- seriously! I have a ton of bathrobes in all different lengths and fabrics- but my favorite ones in my closet are the fuzzy and warm ones. This cardigan literally feels like a bathrobe- except it's of course appropriate to wear out of your house. WIN WIN. This will sell out fast when the NSale opens to the public tomorrow, and I highly recommend it! I ordered size XS/S. 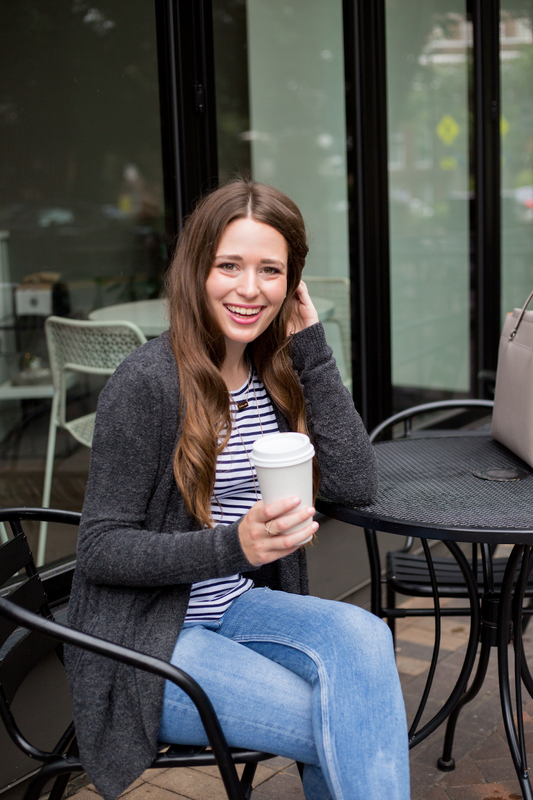 I'm also loving this simple but cute striped long sleeve top! It comes in a variety of colors in the NSale in both striped and printed options. 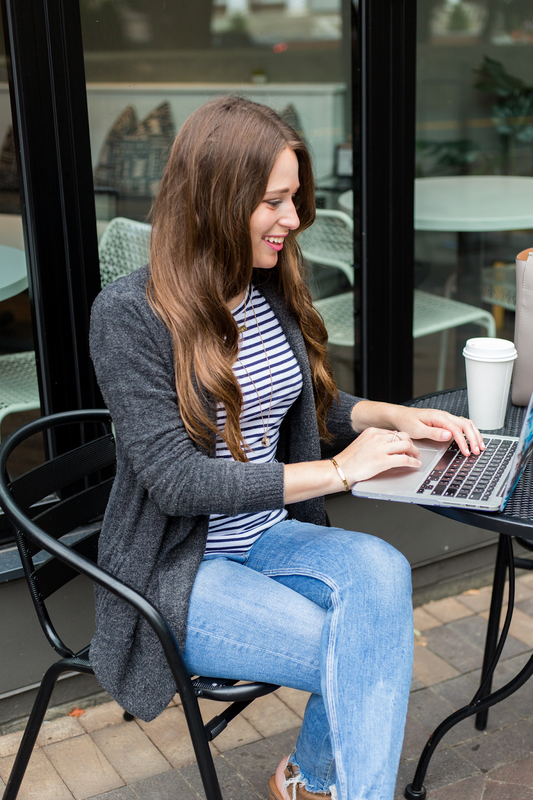 I am already thinking of endless ways to style this come fall and winter- with skirts and tights and a statement necklace, or dressed down with leggings and sneakers for a weekend look. There's so many options. It's under $20- which is a great price both for Nordstrom and also just for such a staple piece! I ordered size S and I liked the fit. So there you have it- my 2018 NSale purchases. I'm proud of myself for really sticking with a budget in this year's sale, and I know I'll be using and wearing all three of my purchases often. I can totally justify making a spluge on something if I will wear it all the time- like with the Barefoot Dreams cardigan! With the sale opening to the public tomorrow- I'm so curious as to what you'll be buying!! Did you also shop the sale Early Access? Or are you planning to after tomorrow? Or just avoiding it in general this year? 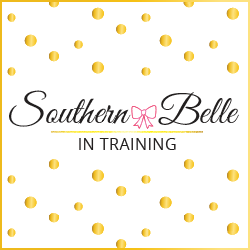 You can check out my 2018 NSale guide to my favorite brands included in the sale in this post, and some NSale beauty picks as well in this post! Oooh you make that cardigan sound like a dream! I've never shopped the NSale! In fact, I've never even shopped at Nordstrom, even though I always love fashion bloggers' posts featuring their clothing. This is super cute! I need to learn how to style myself better. The whole matchup is amazing. The best part about the whole outfit is actually the person wearing it. I can't take my eyes off your sweet smile. Beautiful! That cardigan is so dreamy! One of my best friends bought it and I'm obsessed! Although I already went over my budget for shopping, so I guess I'll be saving up for next year! Love the cardigan - it looks so soft and comfy! I've heard good things about that bra! Love that cardi too. Love how simple and versatile this outfit is! 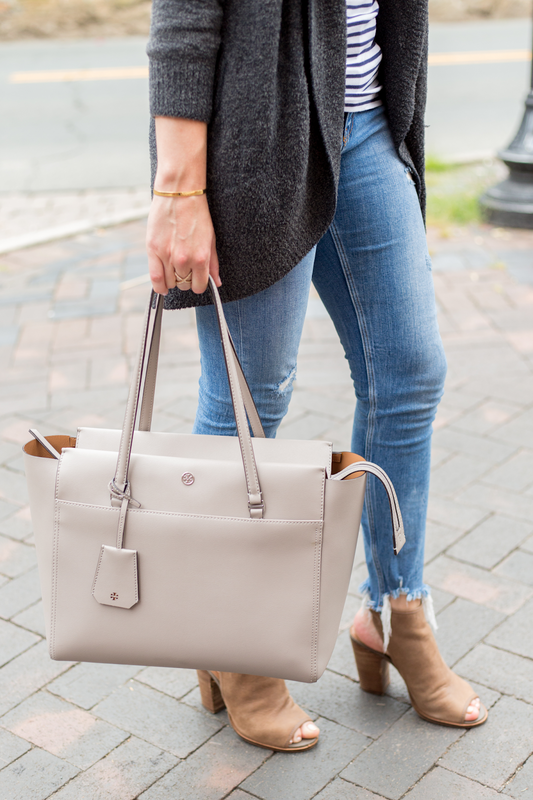 the tory bag is beautiful - i love her totes to haul my work around in! I love how everything from the N Sale is the BEST quality! I really like your casual look. Great picks! Such a beautiful and comfortable outfit! I really like it! I love those shoes I'm a sucker for a good peep toe! Haha I didn't buy anything from the sale this year, just realized I didn't need more stuff and I'd rather save money after my trip. I love what you got - all excellent basics! I never really get anything from the sale, but i know people who get a lot!!! I love the shoes you are wearing though super cute. Oh that striped shirt you have under the cardigain is cute! The shoes, too. I'm a sucker for good shoes. I love how you styled this!! Great picks! I love how casual the whole look is, but still looks super cute. Those shoes are adorable, and I am a huge fan of a good blue jean look. the cardigan sounds comfy and looks great too.